Get the best SUV bike rack in 2018 that fit any vehicle or bike style. Explore hitch, trunk, and roof mount bike carriers. No one wants to put a few hundred dollars bike in the back of the car. The very simple solution is to get a bike rack; but not any rack. Finding the best bicycle rack can be a long process, even today with so many options on the table. The truth is there is no “best” bike carrier for each and every rider – it depends on the vehicle, bike, budget and other priorities. There are three main types of racks: hitch mount bike racks (the ones you mount in your car’s hitch), trunk mount bike racks (the ones that attach to your trunk lid with straps), and roof mount bike racks (sit on the top of your SUV or car). Hitch carriers are a bit more pricey but are more durable, versatile and stable. On the other side are trunk carriers which are more budget-oriented. 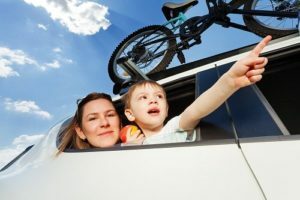 If you are ready for your next adventure, let’s explore the best SUV bike carriers you can buy today. It is considered one of the best hitch bike racks on the market, today. It weighs 51 lbs and it’s actually an upgraded version of its predecessor – Thule T2 Classic. 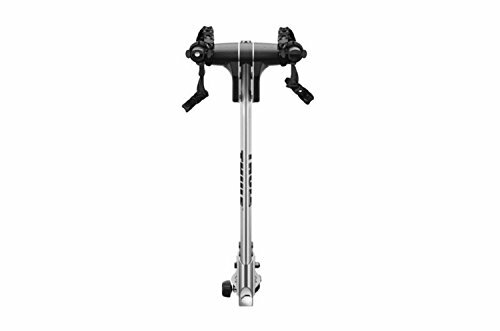 T2 Pro XT allows mounting of virtually any kind of bikes, with its 20-29” supported wheelbase and 5” thickness of the tire, without any adapters. 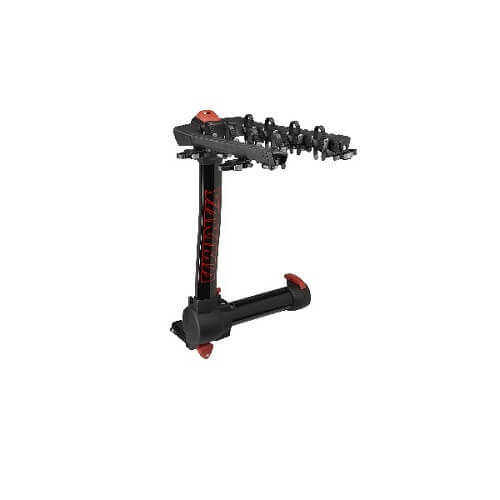 Versatility is further enhanced at this rack by the fitting of 1.25 and 2” receivers and the possibility to extend it’s capacity to 4 bikes with Pro XT add-on. It is best suited for those who intend to leave their carrier in place, due to its weight. Well-suited to carry almost any type of bike. 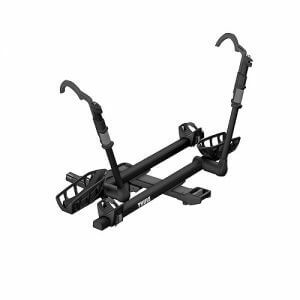 It is a wallet-friendly hitch bicycle carrier for SUV and a good choice for those who do not use the bike rack on a daily basis. It is lightweight and durable, plus it makes use of the frame as an attachment point; however, it is not overly flexible. Security features and vehicle access are limited, but this can be corrected by adding some foam between the bikes. Fits 2-inch trailer hitch and minor assembly is required. The design limits its ability to carry most of the full suspension bikes, but if you are not a frequent rider, this could be a good option. 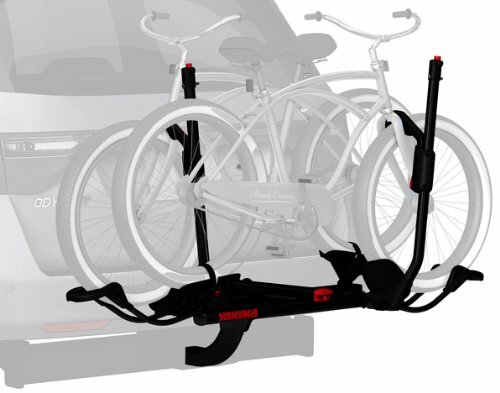 This hitch bike rack can be attached to almost any SUV or car. Even if it’s not that user-friendly like Thule T2 Pro XT or Kuat NV 2.0, it offers excellent ergonomics, it is versatile and accommodates heavier bikes. Well suited for heavy bikes and different bike styles. It is an excellent SUV bike rack and a great alternative to roof carriers. 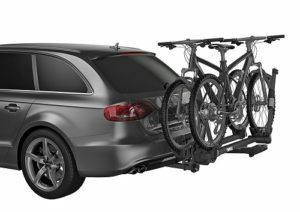 The Allen Sports ultra-compact trunk bike carrier delivers all of the benefits of a full-featured bike rack, built on a rugged steel frame. It is easy to transport and storage when not in use. It is made in USA and fits SUVs, sedans, hatchbacks, and minivans. It is relatively cheap and easy to install. Best suited for lighter duty use, Chinook is a hitch mount bike rack that fits SUVs and cars. It fits both 2-inch and 1.25-inch receivers and accommodates a large variety of bike styles, tire widths and wheels. It comes with a locking hitch pin and locking clamps. Some people say it is not extremely stable, but since it comes at an affordable price, we can’t compare with other more expensive options. If you will be using this tray-style bike carrier infrequently and drive on smooth roads, then this could be a nice option to consider. Three words: versatile, durable, secure. This is how we would describe Kuat NV 2.0, maybe one of the best bike racks for SUV today. It is an updated version of Kuat NV and also contains an integrated work stand. However, this comes with the high price. Well suited to carry downhill, road and mountain bikes and basically almost any type of bike. If you care about aesthetics, then NV 2.0 is the right choice for you. The Saris Bones 3-bike SUV trunk bike rack highlights a vaulted or arched-design which is capable of fitting just about any vehicle. The exclusive anti-sway straps and articulated rubber feet protect both your bike and your vehicle. It folds up into a small size for storage, the design is intelligent and the bicycle carrier is lightweight. 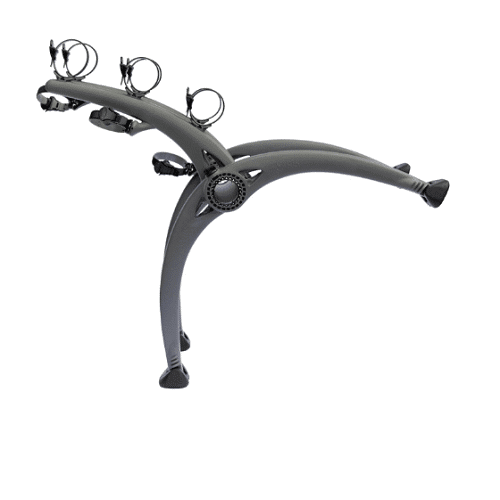 Overall, most buyers of the Saris Bones 801 agreed that this trunk mounted bike rack is well worth the money spent. The rack is well-built, easy to install, and fits a variety of vehicles. 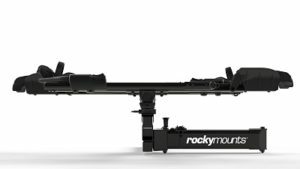 The Rocky Mounts is a bicycle hitch rack for SUV and cars alike, that can carry 2 bikes, with no extension possibilities, but that does not mean it isn’t versatile. You can mount 20” to 29” wheel bikes and this platform, tray-style hitch rack will even get well with your fat bike, as it supports up to 5” wide tires. The design of Yakima FrontLoader makes it capable to carry almost any type of bike, regardless of axle standard. There is no need to remove the front wheel. The FrontLoader is shipped fully assembled. The only set up involved is placing the rack on your roof for attachment to the crossbars. 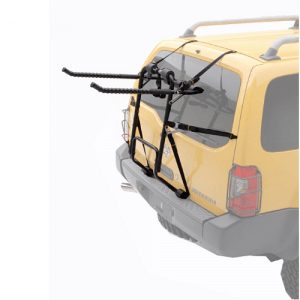 FrontLoader is one of the most popular roof bike rack, suited for vehicles with low roofs. It can work with an SUV but the height will increase considerably. An alternative for SUVs is Kuat Trio. All in all, the design is proven and if you don’t have any problem with height, then this is a good option. A fork mount bike rack that can carry almost any type of bike. This contender arrives mostly assembled right out of the box. It includes a sturdy large diameter cable lock that deploys from the rear of the tray. 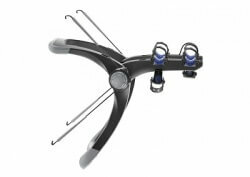 The Trio is a beautifully constructed fork mount roof rack that provides an elegant solution to the multiple axle standards found on bikes. It is secure, durable, easy to use, and it will fit on the vast majority of cross bars. Well suited for those who have vehicles with high roofs, like SUVs. Dr. Tray comes with an innovative design, making it one of the best SUV platform hitch bike carrier today for its versatility. It can carry almost any type of bikes, including fat, road or mountain bikes that are up to 5 inches. Versatility is unmatched due to the variety of bikes supported, the load capacity extension possibility, through the Ez+1 accessory that allows you to carry a third bike. Yakima’s Dr. Tray will suit most of the users that seek a hitch mount tray rack, due to the amazing adjustability, versatility and ease of use, and providing a great clearance. 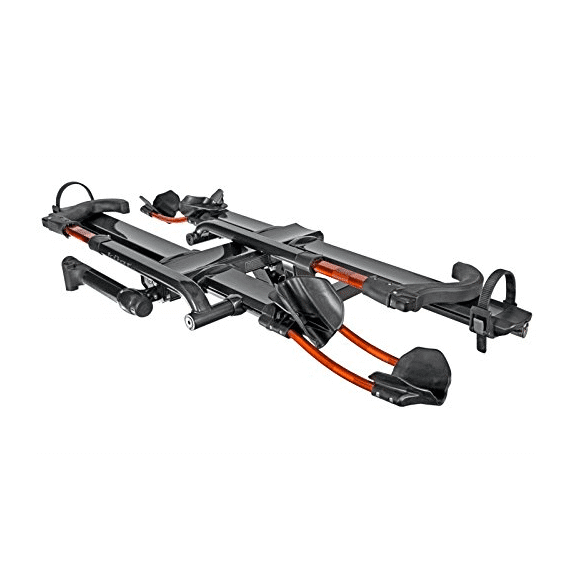 Thule Raceway pro is considered one of the best trunk bike racks in 2018 due to its versatility and security. It is stable and fits a wide range of vehicles. The primary support arms are individually adjustable thus the compatibility with full suspension bikes is increased. 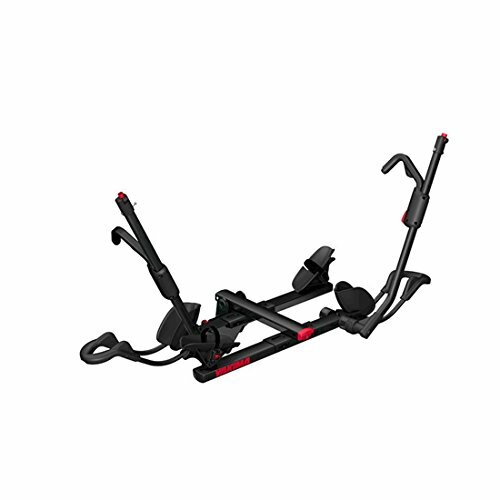 A lightweight bike carrier which can be a nice option for your SUV. Sherpa 2.0 is a powerful contender and should be on your shortlist because it is the lightest rack in its class (32 lbs. ), it is easy to use and offers a secure transportation to your bike. Well suited for standard tire sizes and a viable alternative for Thule T2 Pro XT or Kuat NV 2.0. An exclusive dual positioning trunk/bumper bike carrier that allows a custom fit on most sedans, SUVs, and minivans. High strength tie down buckles and straps ensure a secure fit for heavy loads and up to 4 bikes. 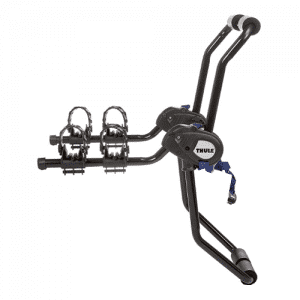 For the most part, this is a great bike rack for short or long distance travel. Customers stated that it was sturdy even over rocky terrains and bumpy roads. They also liked the ease at which it is able to be assembled but stressed that you should check for compatibility even though it states that it fits most vehicles. 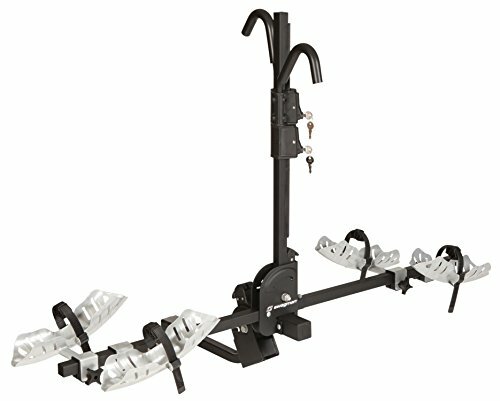 A best buy for SUVs, Yakima RidgeBack hitch mount bike rack is the perfect hitch mount bike rack for those who want to carry up to 4 bikes. It features UpperHand lever that tilts down for vehicle access, Zero-hassle ZipStrips that secure your bicycle to the rack and comes fully assembled. It the way you transport bikes at a higher level. It comes fully assembled right out of the box, tilts down, easily secure your bikes and folds flat for easy storage. Fits 1.25″ and 2″ hitch receiver. A stable trunk mount rack built for family-oriented cyclists that features anti-sway functionality, soft rubber cradles, six-strap system, patented FitDial for a perfect fit and it folds down when not in use. Arms fold down when not in use and arms hold a wider range of bike frames including smaller frames for kids bikes. It has a classic black finish that looks amazing on any vehicle and a maximum carrying capacity of 70 lbs. 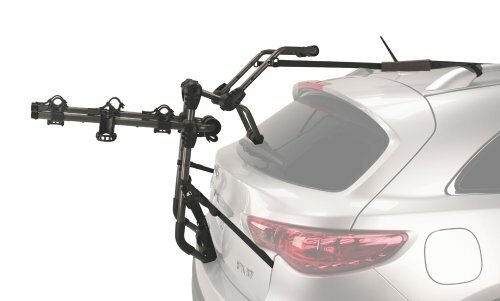 How to choose the BEST bike rack for SUV? When deciding which style of SUV bike carrier to choose you should take into consideration multiple factors. It is not an easy decision. You have different needs. There can be factors like vehicle type, the number of bikes, type of bikes that you will be transporting, budget or how far and how frequently do you need to carry bikes. Here are the main pros and cons and some helpful questions to ask that will make your buying decision a lot easier: How many bikes do you need to carry? How far and how frequently do you plan to carry bikes? Which type of bikes? 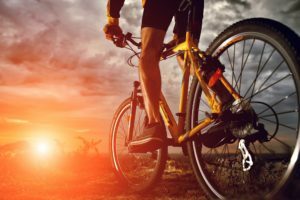 mountain bike, adult or kids bike? are they heavy? Which type of vehicle do you have? How do you want to carry the bikes? on top or as trunk-mounted? maybe hitch-mounted? Rack – ease of use, locking option, flexibility or storage space when not in use are another factors to be considered. Consider what to buy by asking you about vehicle type and bike type. If your SUV has factory crossbars then maybe a roof bike rack system is the best and practical choice. Next is your bike – if you have 20mm through axle forks, for example, Yakima HighRoller or Yakima FrontLoader can be a good fit. If you have downhill bikes and/or without crossbars, then a hitch mount (tray or platform style) might be a good option. SUV bike carriers like Thule T2 Pro XT or Hollywood Racks HR1400 are a good option to carry heavy bikes securely to the final destination. If you don’t have a hitch receiver, then a 2” receiver is recommended since it gives you more options for a compatible bicycle carrier. Be future-proof. Even if you are transporting 1 bike now, in future you may want to add more, so buy a 2 or 3 bike rack. You never know. Bike frame compatibility is also important. 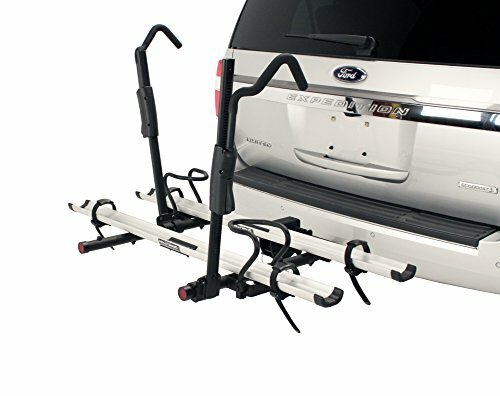 It’s almost impossible to determine the right bicycle rack for your SUV since there are lots of different frame designs, but if you want to stay safe, there are some rack styles that accommodate almost any bike: Yakima FrontLoader, Kuat NV and Kuat NV 2.0, Thule T2 Pro XT or Saris Bones 801. Check your vehicle’s manual before installing a roof system to find the max allowable weight the SUV roof can accommodate. Towing capacity needs to be checked in case of a hitch rack. If you own a tandem bike then roof bike carriers usually do the job, like Yakima Sidewinder. If you do not want to install a hitch receiver or roof racks are not an option, then you may consider purchasing a trunk mount rack. It fits a wide range of SUVs but be aware if you have full suspension mountain bikes or of potential incompatibility. The fit information can be accessed on manufacturer’s websites: Yakima, Thule, Kuat, Allen Sports, Saris. Check vehicle’s payload limits. It’s important to avoid any damage caused by the high load. Securing the bike on the rack may be also a must have. Even if this will cost you extra, it will prevent the theft. Take into account that not all SUV bicycle racks came with this feature so you might consider to buy it. Even if your bike is not expensive, an additional cable lock may prevent some headaches and some extra money in your pocket. The hitch mount bike rack is the most versatile while it can carry up to 5 bikes. It is required a hitch receiver though. It is the easiest way to carry multiple bikes and it will not damage the car paint. You have two main types to choose from: hanging (support arm) and platform (tray-style). Explore the full range of hitch bike racks. Hitch bicycle racks for SUV require a hitch receiver (which can be installed if needed) and the cost for these carriers is a bit higher as they offer more sophisticated materials and features. Platform-style carriers can hold 2 bikes and can be extended to 4 bikes; these type of bicycle carriers offer a higher weight limit and Amazon offers a wide range from which you can choose. 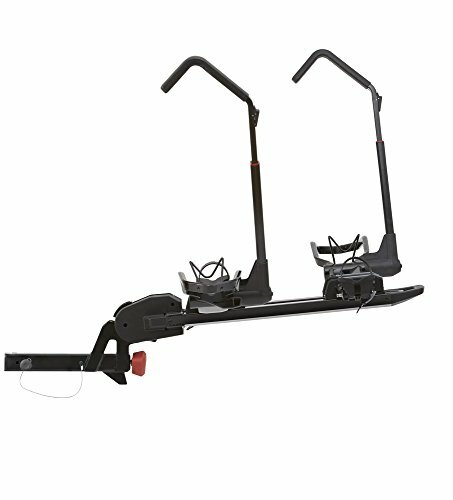 Trailer hitch bike carrier for SUV can transport 2 to 5 bikes, the installation and removal are easy, minimum effort is required for lifting, compared with roof bike racks, locks are available and some fold flat against the vehicle. However, the price is a bit higher, the trunk or rear door might be blocked, bikes may partially obstruct license plate and taillights and the driver must remain aware of SUV’s extended length. Tray style hitch mounts have some ergonomic advantages when it comes to loading and you can carry mainly any type of bicycle. Hitch mounted bike racks for SUV keep bicycles out of the wind but can make parking in tight places difficult. Some bike racks from Amazon can respond to your needs, like Thule T2 Pro XT or Yakima RidgeBack. Pros: can transport up to 5 bikes, generally the installation is simple, fuel consumption is not that high, it is not permanently attached to the vehicle, locks are available, easy to load and unload, bikes can be strong secured, some fold flat against vehicle to provide clearance to the trunk, bicycles attach with a moderate amount of lifting. Cons: a receiver hitch is needed, swing-away models which offer the easiest access, are also the most expensive, the driver must be aware of SUV’s extended length, bicycles may partially obstruct taillights or rear license plate. 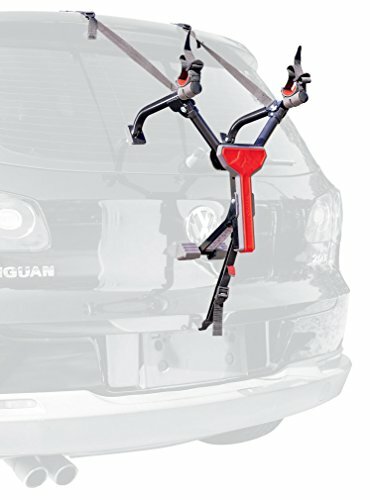 Trunk mount bike racks may be an alternative for your SUV especially if you don’t prefer roof racks. They involve the least amount of installation and the least expensive way to transport your bike to the desired destination. 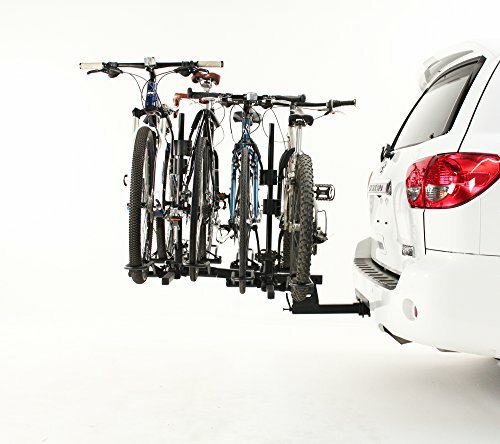 SUV trunk bike racks are lightweight, can transport 2-3 bikes and are an economical choice. The same bike carrier can be easily moved between vehicles. Straps with hooks are used to secure them to the SUV and the attachment system will prevent you from being able to open the hatch when needed. Bikes rest on support arms equipped with cradles. Also, security from theft is limited. The design limits rack’s ability to carry full suspension mountain bikes for example. Maximum allowed weight capacity per bike is around 30-35lbs so could not be a good option for massive bicycles. You will notice that some bike racks for SUV carry the same nr of bicycles but the price is different; this happens due to extra versatility to fit more vehicles, extra features (like anti-sway cradles, or fold-away), locking options, better materials. 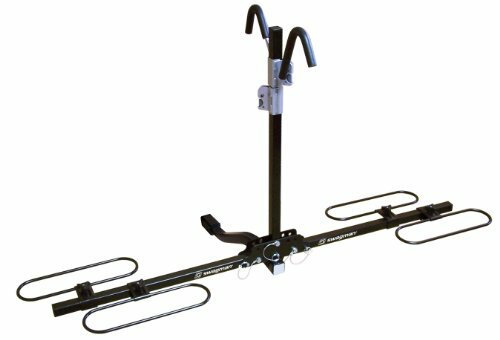 Amazon offers a wide range of bike carriers which are very good, like Saris Bones 801 or Hollywood Racks Heavy Duty. Explore the full range of trunk bike racks. Pros: easy installation, lightweight, moderate amount of lifting is needed, least expensive option, fold for easy storage, handy for occasional use. Cons: least secure, the trunk is blocked, bikes may sway during transport if are not properly fixed, SUV’s finish may be affected if you do not pay attention while attaching hooks, requires some maintenance during transit just to be sure you are not losing them. One of the best bike racks for SUV is the roof mounted styles due to its versatility. However, take into account that mounted onto an SUV will require lifting the bicycle over your head. If you will manage to do that you may consider that you will likely only be able to carry 2 bikes since the center of the crossbars will be out of reach. Many people appreciate their stability while driving. It is recommended to check your vehicle’s manual or contact the manufacturer directly to understand the max allowable weight the roof can maintain. Bike carriers for roof racks vary between ones that allow both wheels to remain on the bicycle and the ones that require front wheel removal. Car bike racks that keep both wheels on the bicycle are taller, can be less stable and cost more while those with front wheel removal are great for SUVs and can be easier to load and unload. 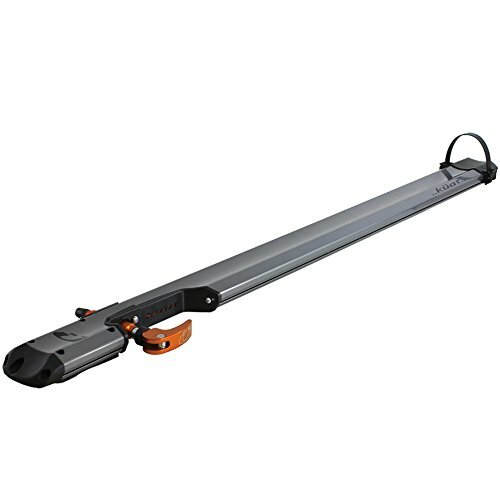 Crossbars can be used to carry other equipment like kayaks or cargo boxes. Roof SUV bike racks are versatile, generate moderate cost, there is no bike-to-bike contact and no visual obstruction to driver’s view. However, the aerodynamics of SUV is reduced, some noise may be caused by wind resistance, can be hard to load the bicycles, the driver must be aware of height restrictions. Some Amazon bike racks may be perfect for your needs, like Yakima FrontLoader or Yakima ForkLift. Explore the full range of roof bike racks. Pros: versatile for all kinds of gear hauling, moderate cost, bikes do not sway, no obstructions to driver’s view, bike-to-rack lockers available, one of the most secure carriers, access to any doors/hatch/tailgate. Cons: wind resistance reduce aerodynamics, the driver must be always aware of height restrictions, may be hard to load and unload items, fuel consumption will likely increase. 1-bike and 2-bike racks are ideal for those who don’t have many bicycles and roof mount is the best choice. Remember is always good to be future-proof and choose a 3-bike or even 4-bike rack even if you have 2 bicycles now. 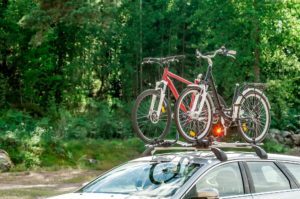 If you want to carry different types of bicycles on the same rack, then hitch mount and trunk mount are your best option. 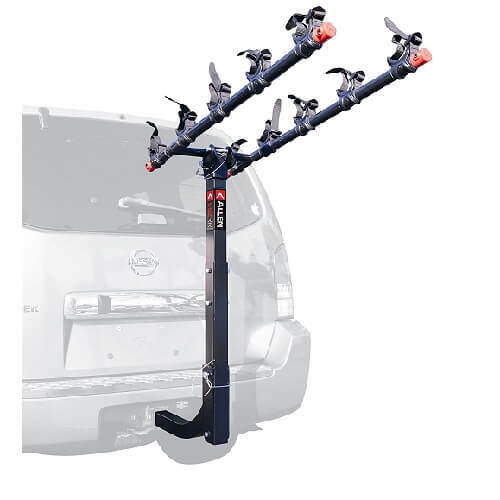 For a better stability and protection, trailer hitch 4-bike rack for SUV might be ideal. You can transport road or mountain bikes, child or women bikes and through axles, disc brakes, and full suspension bikes. We recommend Allen Sports, Thule, Kuat and Yakima carriers. 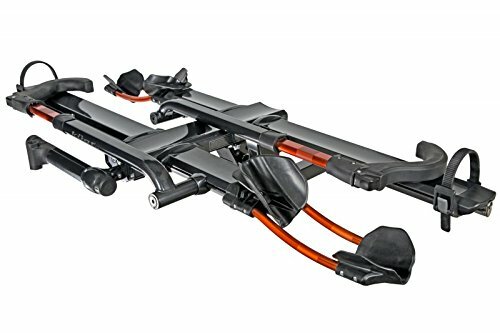 5-bike carriers are not so popular since the load is very high, but if you really want to buy one, then Amazon has some good offers from various brands. Discover each of the bike rack manufacturers below has to offer. By giving you some hints we would like to mention that Allen bike racks offer hitch, trunk, and spare-tire mounting options and they place in the middle when it comes to price. 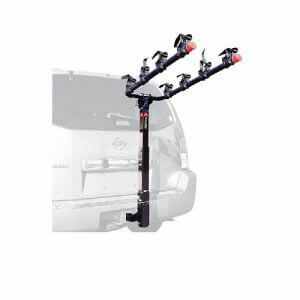 For example, Allen Sports Deluxe 4-bike Hitch Mount Rack is one of their best sellers. 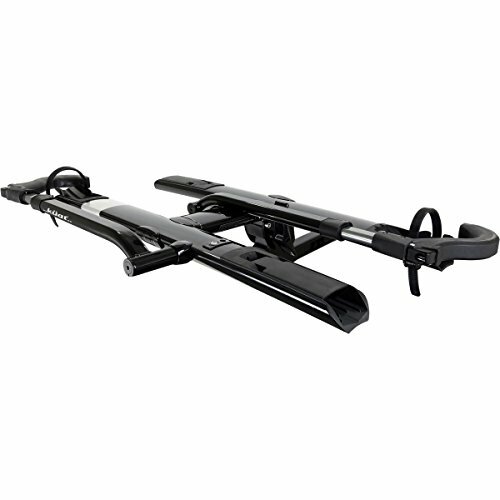 Thule SUV bike racks offer great quality and you can choose between hitch, roof, and trunk mounting options. 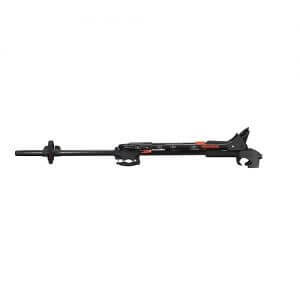 Thule T2 Pro XT is one of their best product. Yakima offers from hitch to spare-tire racks and Ridgeback and FrontLoader bike carriers are one of their best sellers. When it comes to the highest security and stability Kuat stands out from the crowd. 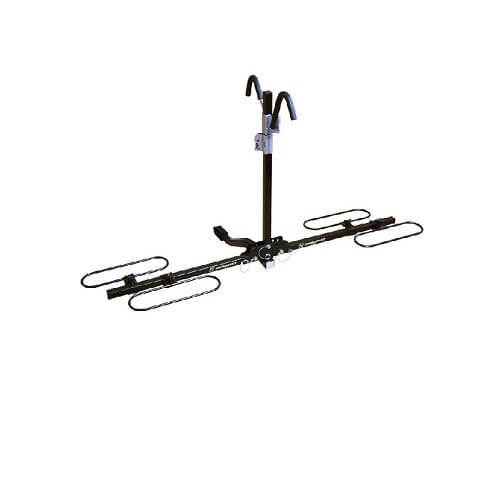 They offer amazing hitch mount bike racks for SUV but the price is also on the expectation. Kuat NV 2.0 appears to be a complete rack system with an amazing design. Explore the full range of bike racks from Thule. Explore the full range of bike racks from Kuat. 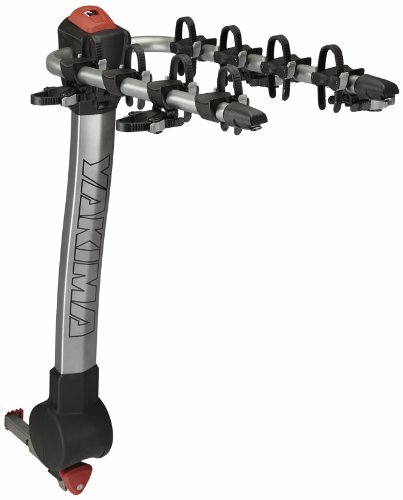 Explore the full range of bike carriers from Yakima. Explore the full range of bike racks from Saris. Explore Swagman’s range of bike racks. Explore the full range of bike racks from RockyMounts. Explore Hollywood Racks’ range of bike racks. Explore the full range of bike racks from Allen Sports.